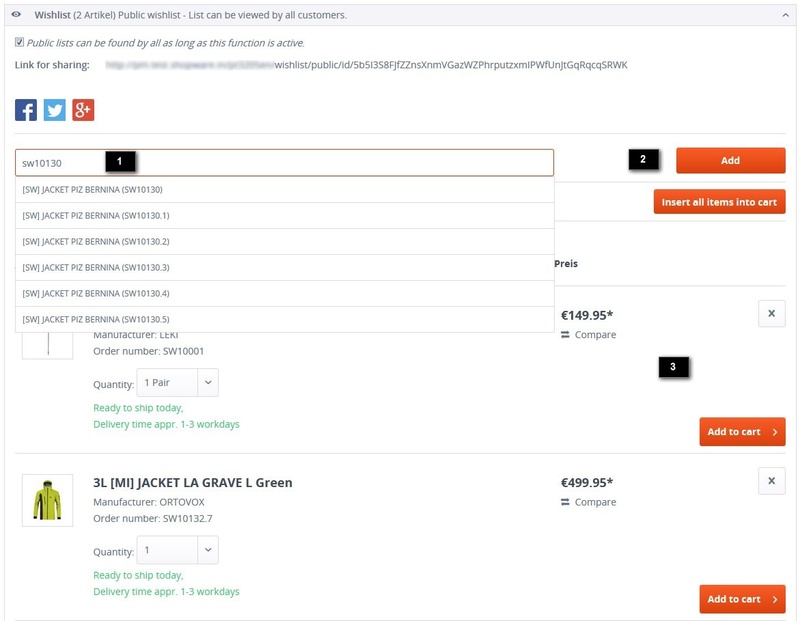 The Advanced Cart Premium Plugin for Shopware allows shopping carts to be saved for extended lengths of time. 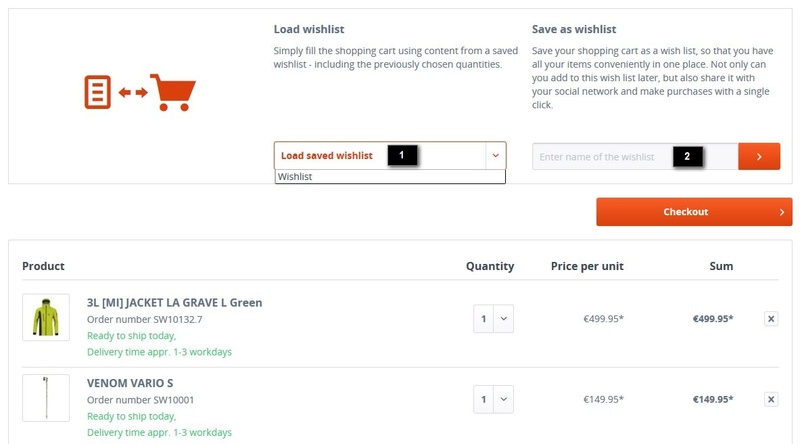 These shopping carts can be viewed as "Wishlists" in the "My account" area and listed as either private or as public, allowing others to see them via direct link regardless of whether they are registered in your shop. In addition, these wishlists can be sent to friends via email, or shared on Facebook, Google or Twitter. Shared shopping carts can then be taken over with a single click, or alternatively individual items can also be selected. 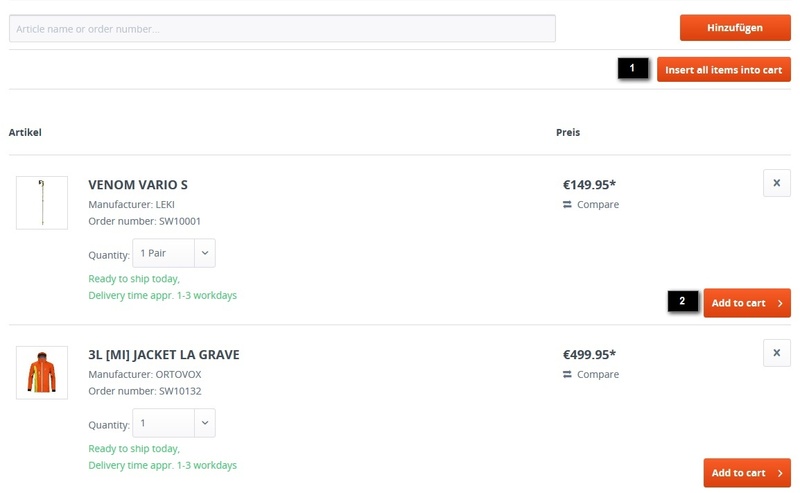 The Advanced Cart Premium Plugin in the Shopware Community Store. The plugin can be configured directly in the Plugin Manager or through Configuration --> Basic settings --> Additional settings --> Advanced Cart. Session basket save time in days (1): In this option set the day after which shopping carts should be deleted. 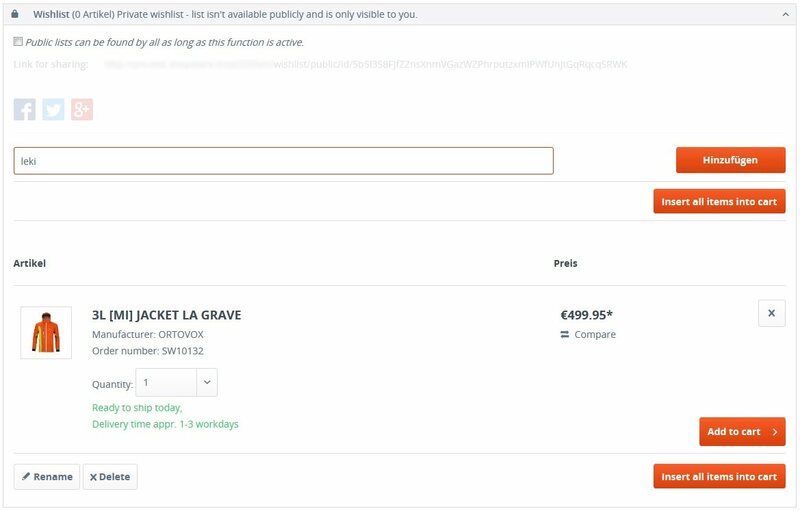 Clear existing basket on wishlist restore (2): With this option you can set whether the shopping cart will be emptied after the customer loads his wishlist into the shopping cart. Share via email (3): If this option is activated, it will be possible to share wishlists via email from the My Account interface. This function is disabled by default. Before activating this function, be sure to check the relevant legal provisions of the country. Recommend article combinations (4): This option allows you to offer your customers the opportunity to suggest article combinations. Customers viewing an article detail page receive an article slider which includes other articles of a wishlist. Replace default wishlist (5): Selecting this will replace the wishlist with the current notepad. Facebook App-ID (6): If you wish to use features such as the "Like" or "Comment" functions, you must first enter your Facebook App-ID here. Facebook Likes (7): This activates the option to "Like" articles in the shop on Facebook. Facebook Comments (8): Activating this option enables Facebook Comments. To create a wish list, go to My account and then Wishlists (1). Next, enter a name (2) and then click on Create wishlist (3) to save it. To add an article to the wishlist, enter the article number or name in the Search box (1). Then click the Add (2) button. The article should now appear in your wishlist. Here you can rename and delete (1) wishlists. Here you have the opportunity to put all articles of the wish list in the shopping cart. For this, a single click is enough. If you so click one the respective articles, only these will be added from your wish list into the shopping cart. Here we'll show you the different options when publishing a wishlist. To make a wishlist public, simply check the box as indicated in the image below. Here you will find the link of the wishlist for sharing with friends. The link is only accessible when the list is published. If the hook is later deleted, the link is no longer available. Once the wishlist is made public, you an use this option. This option is for sharing over Twitter. And here is the option for sharing over Google+. When the option "Clear existing basket on wishlist restore" is activated in the plugin settings, only the articles from the wishlist are loaded. The separate articles will be deleted.